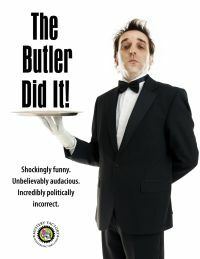 Confound, amaze, and delight your guests with a Butler and a Maid who have a story to tell and the bad manners to make sure they’re heard. This is a party that shakes up the status quo, turns decorum on its ear, and gives your guests a hilarious evening they won’t soon forget. Your guests realize that this is not going to be a boring dinner party. Take a wild ride on someone else’s relationship. Before the night is over something is stolen, accusations are hurled, gun’s are blazing, and everyone lives happily ever after.